Like so many of us, my relationship with the Internet is complicated. I love the Internet. Ever since that guy first told me: “You’ve got mail!” in 1996, I’ve been hooked. I love the ease, the quickness, and the ability to retrieve video clips from the USA women’s gymnastics team’s international competitions before NBC airs them. But I love books too. I love their non-quickness and the space they afford. I love the things I associate with them: vacation, school, bedtime, and bookstores. And since the two are so different, when creating content, I think it’s sometimes best to choose the appropriate medium first and then go for it. For example, a video of making chocolate éclairs with your Mom while she downs cans of Diet Coke? Internet. The story of how learning how to cook has changed my world view and helped me redefine the meaning of success? I think that’s book material. In my life, the Internet is fun, quick, occasionally thoughtful, and a pinch stressful. Books, on the other hand, are calming, restorative, and very rarely stressful. And I love food blogs (obviously)—all those recipes and voices and glimpses into other people’s lives and kitchens—but sometimes there’s just no substitute for paging through a beautiful, food-stained cookbook. Also coincidentally, a short essay that I wrote on the intended (and unintended) consequences of Internet distraction will be published in the next installment of the awesome literary journal The Rattling Wall. It’s a fantastic press, so be sure to pick it up! Put the grits in a medium pot, whisk in 5 cups cold water, and season with salt. Bring to a simmer over medium-high heat. Cover and cook, stirring frequently and adding additional water as needed, until they are creamy and tender. If you are using the Carolina Gold rice grits, this will take 45 minutes to an hour or longer. The corn grits I used took only 15-20 minutes. Add butter to taste and season again with salt. 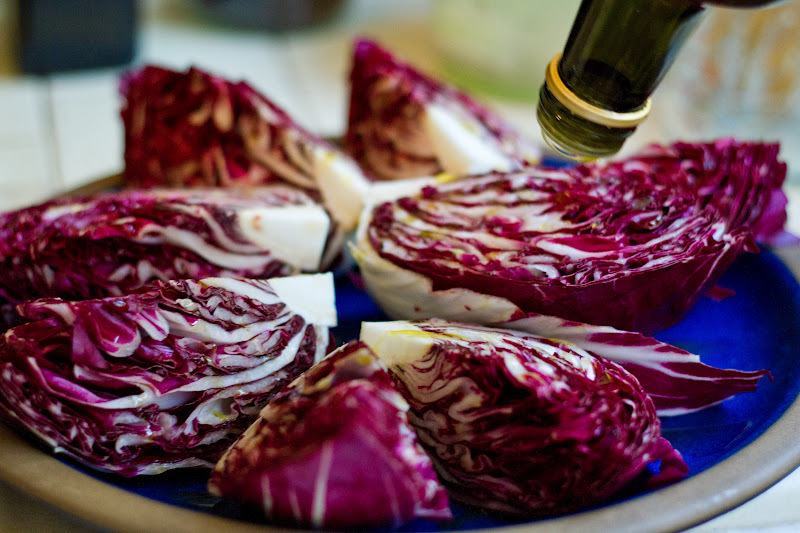 Put the radicchio on a large plate and drizzle with olive oil, sprinkle all over with the sugar, and season generously with salt and pepper. 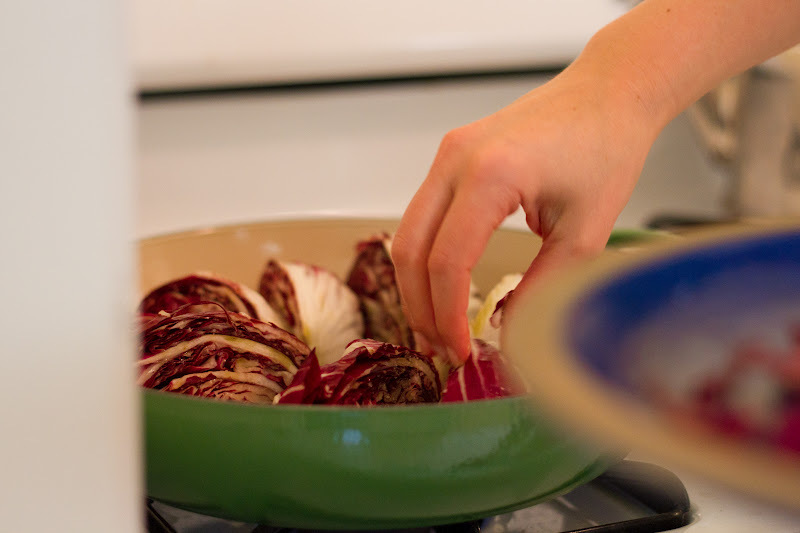 Sear the radicchio, starting with the cut side down, in a cast-iron pan over medium-high heat until it is caramelized and tender, 2-3 minutes per side. Put the mozzarella in a bowl of hot, salted water for 30 seconds to heat and then drain. 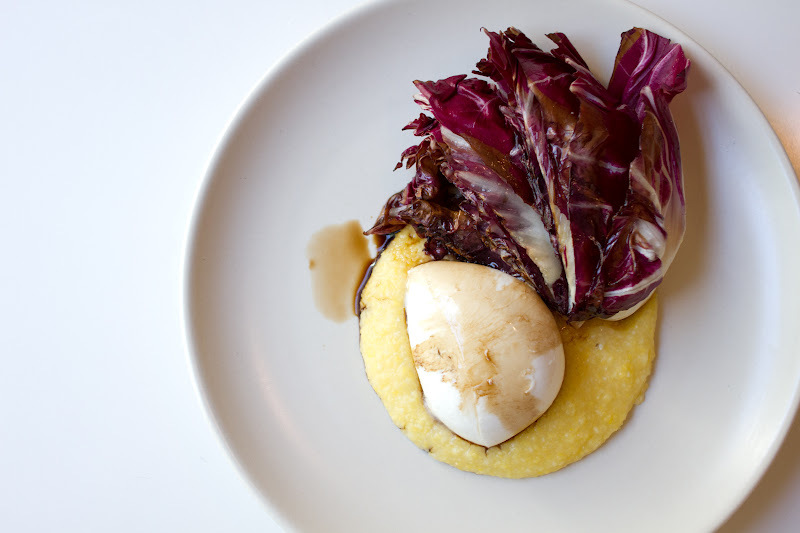 Divide the grits among four warm plates, and arrange the cheese and radicchio alongside. Drizzle with balsamic and sprinkle with sea salt. I love that quote, those grits, and all the stories you've been hoarding! Also, I agree, we should have grits more often. This looks beautiful! I wouldn't call myself a radicchio expert by any means but I think what you have there is the Chioggia variety whereas Andrea Reusing sports the Treviso variety. But again, I'm no expert! Good luck with your proposal. I'm with you. Will always love a good book and I cannot wait to read yours! I LOVE this post and swear something must be in the air. I just reread The Writing Life last week, poolside in Palm Springs. It's funny how you glean different things each time you read a book. This time, I got stuck on the chapter about time-specifically, how we spend it, how we spend our lives. Anyway, I always enjoy reading every word of your posts. You always have something thoughtful to say, and I never get the sense of "Oh man, you just came up with that life-food analogy last second!" that other blogs sometimes give me. Hope your writing is going well and steadily! I'm a big paper/book/old-fashioned print fan here, so I would gladly read your book! This is not a thoughtful comment to follow your very thoughtful post, but Trader Joe's just recently debuted some tasty stone ground grits, which are probably closer to those in the recipe. I cannot wait to read your book just as much as I cannot wait to read your blog posts! I am starting to imagine all the places your book filled with stories will go! Also this looks really delicious! Haha, I really love the name of the blog. Sarah! What a cool coincidence! Now I want to reread that chapter! Anyway, and as always, thanks so much for your support!! Yes, grits are delicious. I also love that in the South, where I grew up, girls wear sweats that say "GRITS" for "Girls Raised In the South". I was born in Indiana, so I unfortunately don't have one. Also, I don't mind that you hoard the good stuff, because even the not-book worthy is interesting. I once had an advanced-in-years photographer friend who was also a mountaineer and who'd photographed Mother Theresa countless times, whose photos or projects were often stolen. He always said that he didn't mind that, because that meant he'd have to come up with a new idea, and he always did. I think there's a lot of truth about that. As for the internet/writing dilemma, I've been musing about that too (also on my blog - go figure! talk about "being in the air"), but since I live where I do, I have a specific need for internet communication. What I find lacking on the internet is continued conversations and community building. That said... I'm looking forward to reading your book, because I can enjoy all your humour and insights... from my reading armchair! P.S. Polenta/grits is sooo good with grated Parmesan and a little bit of olive oil and salt. Sometimes I make the grits, put a pan with a bit of oil in the oven, add the grits and Parmesan (and a touch of pounded chili) and bake it. The last sentence of A.Dillard´s paragraph just kills me. So graphic! And then you go on about the fleeting vs. permanent, internet vs. books... Great post, love it, it just has me thinking about life for hours now! your piece is the perfect inspiration for my day of writing. thank you! 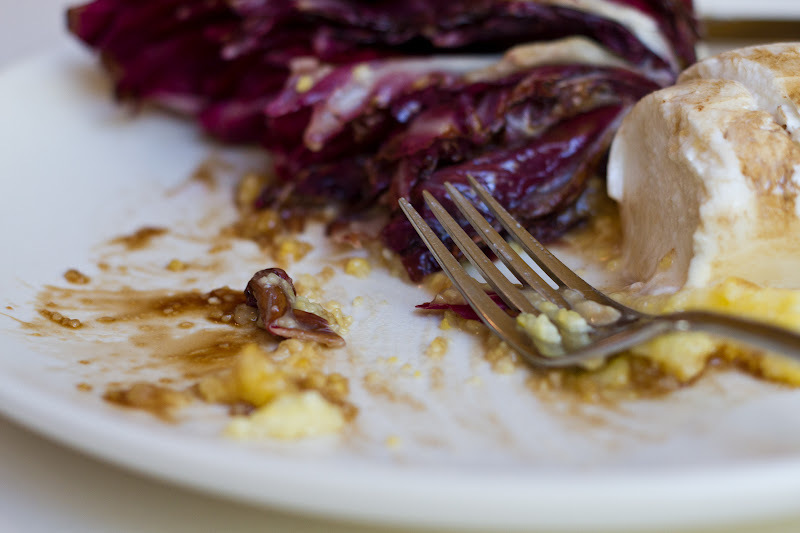 Grilled Radicchio is one of my favorite things. As is this blog. I love how Matt always makes the sweetest comments on each of your posts...well-deserved :). Good luck with your proposal! Wow, the part about opening up your safe and finding only ashes- that's going to stick with me for a long time. I've read that while grilling radicchio brings out its sweetness, it also amplifies the bitterness. Go figure. I do love it though, and often pair it with grilled Belgian endive. I like the idea of serving it with polenta and mozzarella. Very good advice on writing and sharing. It does seem to be instinctual to hoard an idea away, but I like the thought that an even better one will come around later. Too true, and encouraging! Another good side effect would be not pouring over an idea and analyzing until you hate it. Just get it out there, while you love it! 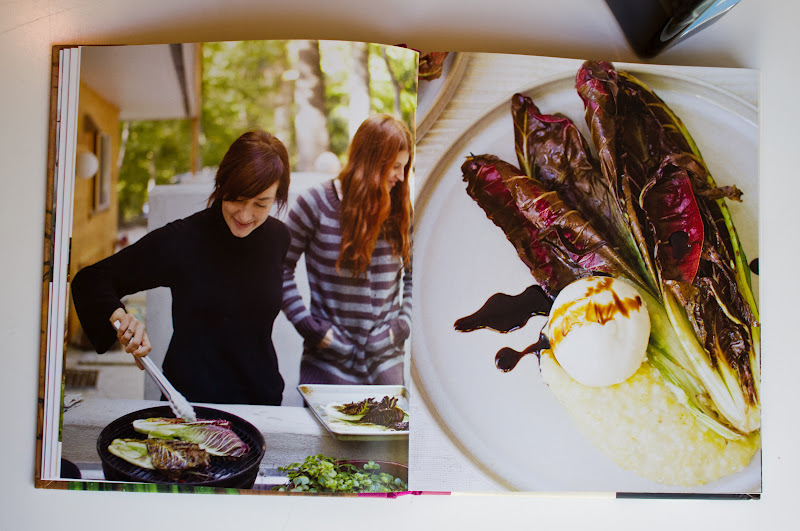 lovely photos and recipe. I look very forward to reading all these stories youve been hoarding. hopefully one day soon. Wow. What an amazingly inspiring quote. I really have a problem with hoarding of things both tangible and non - I have been known to "save" "good" clothes so long that I never wear them (aka, they turn to ash). I ate a lot of grits in Baton Rouge last week. Grits are delicious. Congratulations on the essay! I cannot wait to read it. Your essays are the best! That photo of the girls in the book is SOOOO comforting. Makes me think of cookouts at the beach with friends. Ahh, the beach! 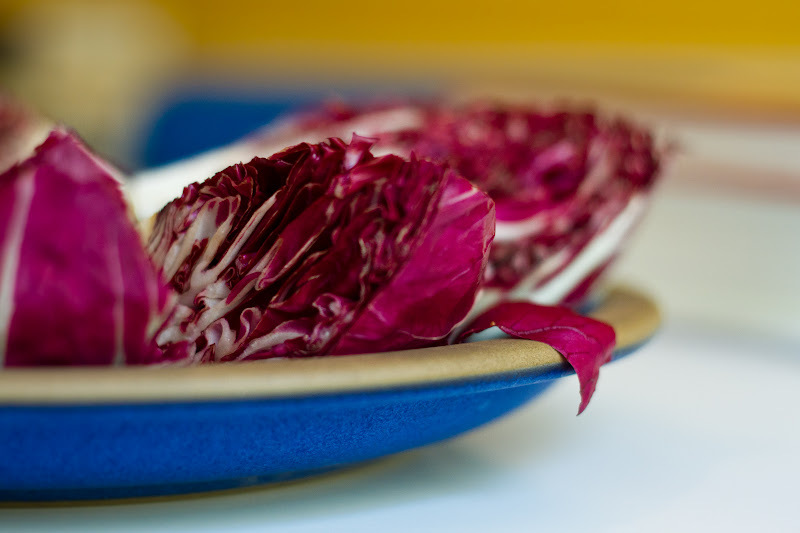 I've never seen gorgeous radicchio like in the cookbook before. Wowza. I love this post and if this is what's "left over" from your writing hoarding, your book is on my pre pre-order list! PizzaTheHutt.doc, yes! speaking of the internet being stressful, i've been stressed for days by this post! i LOVED reading your thoughts about hoarding ideas and have been wanting to devote some time to responding thoughtfully. but then thoughtful internet time hasn't materialized for me, bla bla... can we just talk on the phone?? thx! i love this post and i love PizzaTheHutt!!! I love this! I want to eat that meal while reading your book! K? In a bath. JK. The Writing Life is required reading for my students this quarter. Can't wait to share this with them -- they are all writing non-fiction books right now so I think they will relate to this. Thanks, Anne! and that's soooo cool. What a great effing book it is!! 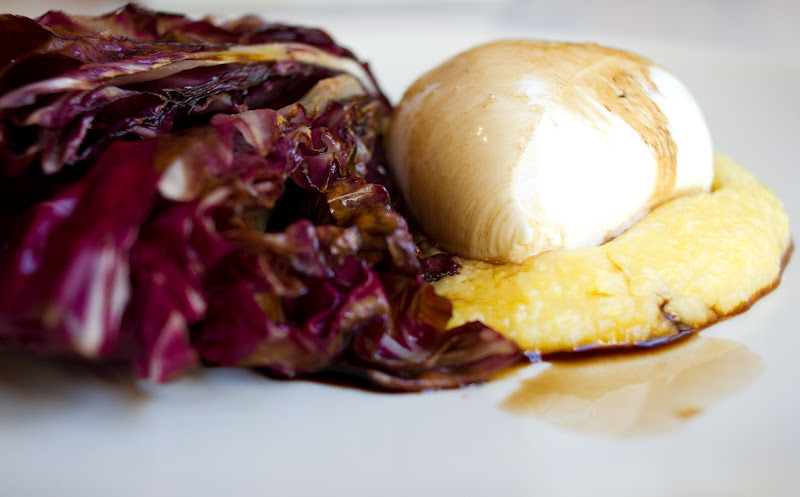 Ah radicchio- we've got in a bad habit when something is ridiculous saying 'that's radicchio'. I think we need to rebrand it in the house - I like the Trevisio more for grilling and the orbs more for salads. And I love what you've written here. Can't wait to read the book. Seriously. Thanks so much for allll of this. Grits with Parmesan and chili sounds so delicious. It *is* tricky -- knowing what to save and what not to save. I agree with Annie, though, when I spend it (in my book or on my blog), I do find more ideas well right up, ready to go. This is in stark contrast to when I save it and try to make the perfect paragraph in my head without putting it down -- it doesn't go anywhere. Good luck with writing -- everywhere! i wonder if part of the "spend it now" maxim is that we do not always have an objective understanding of our best stories. we're coming from the context of our own lives and can get blinded. kara wrote something brilliant about how the stories that break her are the ones she thinks are bigger than they are. & it's surprising to me how sometimes what we think of as more our chaff is actually that which more people will find the most accessible and relevant to their own lives. aww, thanks, Whitney. and how are you doing?! …AND i just spent my sunday morning reading back this far. you are the greatest and i cannot WAIT for your book. your writing is so warm, captivating, hilarious…. i love it!!! aww, thank you so much Olivia. That's really, really nice to hear.